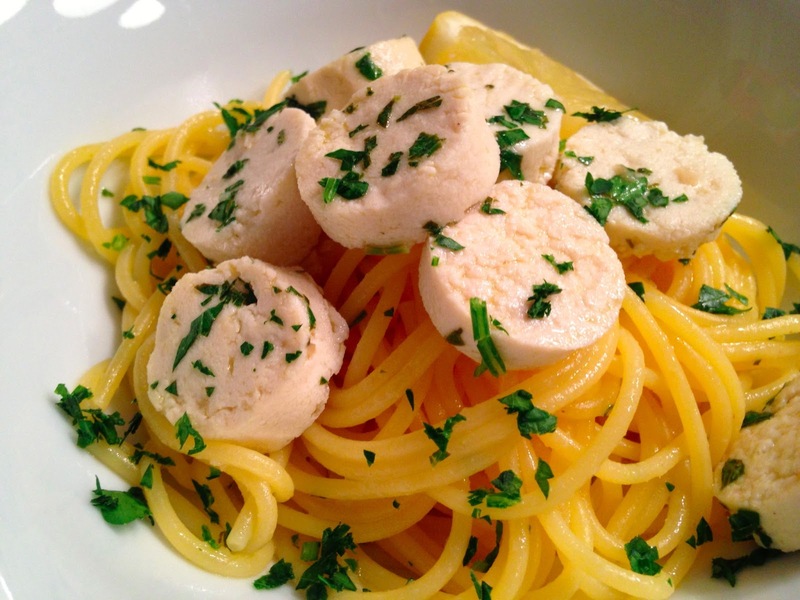 The time has come to make tofu scampi. I always cut tofu into squares or rectangles, but I wanted to do something different this time. So I used a small cookie cutter to make circles. Such a fun way to eat a really delicious dish. Use the tofu scraps for a scramble! Note: Garlic turns blue/green if cooked too long with lemon or wine. Seriously. It still tastes good, as I learned, but it’s not pretty. Some kind of chemical reaction! Solution: add the lemon juice and wine right at the end. Another note: fresh parsley makes an ordinary dish extraordinary! Get into the habit of keeping fresh parsley in a cup of water in the refrigerator. Press the tofu. Cut into rounds using a cookie cutter and then slice thinly. Mince the garlic and chop the parsley. Sauté garlic in Earth Balance and oil until soft. Add the tofu and heat through. Add the wine and lemon juice and cook for a minute. Toss the pasta into the sauce and serve with a slice of lemon. Enjoy!